Huancayo, is a province in central Peru and the capital of the Junin Region. It is also where a little girl was found crying on a sidewalk by 2 police officers. Next to her was a dog that was barking, as if to summon help for the child. The officers approached and asked the girl her name. The dog continued to bark and seemed ready for attack. The toddler was unable to give her name and the officers suspected she might be lost. Then one of the men, Officer Angel Quispe slowly reached out his hand to show the dog he was there to help and the canine immediately quieted down, allowing the officer to pet her. They started walking the little girl around and asking if anyone knew who she was. But they had no luck. Then the dog started walking and the police followed with the little girl tow. About 8 blocks later the dog walked up to a house and sat down right in front. Jackpot! Perla, the family dog guided the little girl home. Turned out the toddler walked out of the house when her mother went to the market and did not properly secure the door. 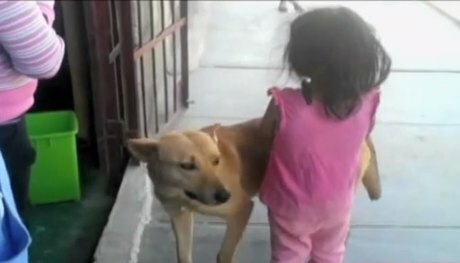 The little girl was saved by the family dog who guided them home! Dogs are smart and this one seemed to know the small girl should not be outside the house without supervision. Perla stayed by the girl’s side, guarding her from potential predators and begging for help. This story is not so uncommon. Just last year a 3 year old girl that was lost for 11 days in a Siberian forest, was miraculously found thanks to her puppy. Karina Chikitova’s father was unaware she was following him as he left his home and headed for another remote village. She fell behind and became lost. Her dad thought she was home, while her mother thought she was with her dad. No one knew she was missing until 4 days later when the parents spoke to each other by phone. Her puppy stayed with her for 9 days and nights before returning home for help. She was found 2 days later, thanks to the guide pup. The girl took cover in long grass to stay warm and cuddled her puppy through the near freezing nights. She stayed alive eating wild berries and river water. Karina Chikitova suffered only minor insect bites and scratches to her feet after losing her shoes. Her pup was able to do in a day and half what helicopters and humans were unable to accomplish in 9 days.